Laphroaig - or 'Leapfrog' as a friend from That London refers to it - always was, remains so, and just is. In describing the experience of drinking this apparently rough-hewn Islay whisky it seems a waste of time to stray beyond the usual nods to 'linament', 'embrocation', or whatever medicinal term springs to mind when describing the taste. But stick your nose in a glass and try to disentangle all the flavour notes and it turns out to be a bit of an all-rounder. In fact it's an elusive dram; an educated Scot in the late 16C could have been talking about Laphroaig when he stated: "Sa peirles proud, as na toung of man is able to discriue." But here goes, in an attempt to discriue what it's like to sup a dram of the 10yo. On the nose: soft buttery, vanilla notes; in the mouth a suggestion of a good, sweet serrano ham. Not as linament-strong as I remember and a slightly dry oakiness developing afterwards. 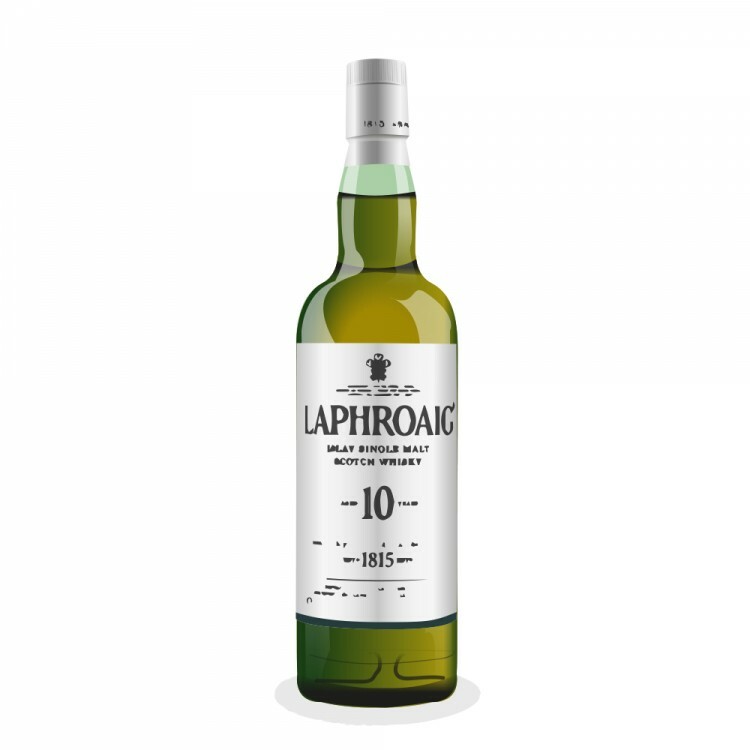 I've just finished a bottle of Triplewood and where that curious expression was busy and extrovert, the 10yo by comparison is subtle - and that's something I'd never thought to say about any Laphroaig. In summary, it's a classic dram. Once tasted, never forgotten, its seeming austerity - bottled behind the plainest label of any malt I can think of - slowly gives way to what turns out to be a bit of an old sweetie. I could have used a few extra percentage points in abv: 40% seems almost niggardly these days. @kalekas, did your reviews get mixed up? I wonder what bottle this review is actually is for, as it does not at all sound like Laphroaig 10. 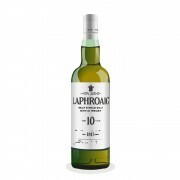 I think most would agree that Laphroaig 10 is not an all-rounder, and also, my bottle is at 43%. I missed part of the escense of your review, as I don't know what embrocation or discriue mean. Hey there @AboutChoice, Nope, I stand by the review; it was a bottle of 40% Laphroaig 10yo that I was sampling. I've always been a bit cautious about nosing and describing the mouth feel of a whisky and, much as I admire Jim Murray, some of his descriptions seem a bit over-colourful. But this site encourages reviews and reviews encourage an attempt to describe new and old favourites in terms of what the individual senses when they concentrate on a glass of whisky. I have to admit that very few whiskies are true 'all-rounders', especially if they are to retain the qualities that make them special - maybe Highland Park comes closest to a true all-rounder - but continuing acquaintance with Laphroaig 10yo makes me appreciate that it's got a number of dimensions: sweet and salty, rich and austere, tangy and buttery. In short, I still think it's valid to call it a "bit" of an all-rounder. 'Embrocation' means the same as linament and 'discriue' is auld Scots for 'describe' - the OED lists 'descrier' as 'one who descries or discovers' Apologies for being elusive, like my 10yo, I thought it could be descried from its context. I think it was a refreshingly different review. Good job. I concur with the buttery notes but wouldn't say it's subtle compared to the triple or QC. I found the peat isn't as well balanced as it is in the QC especially. Hi @Kalekas, OK, so you really meant what you wrote! And, as a result, I'm so curious that I will resample Laph 10, and all my other "smokies" from a more in-depth and discerning perspective. And BTW, my Laph 10 (75cl) is at 43%, and the 70cl bottles appear to be at 40% ... wonder what that is about ?? I wonder if that has something to do with the taste profile ? Hey again @AboutChoice. Thanks for the response and it's curious the 75cl bottles have that extra bit of oomph. My personal whisky range certainly ain't confined to the smoky end. I still love Glenmorangie's experiments with different woods: I loved the Sonnalta PX and wifie's just returned from Oxford with a bottle of Nectar d'Or that I'm really looking forward to sampling. My 'gateway' whisky was a Macallan if memory serves. In the end it comes down to whether I'm feeling austere, when I feel like a Laphroiag or an Ardbeg or hedonistic, when a Glenmorangie Portwood or something similarly goes down a treat. Of your four all-rounders, the only one I've tried is the Jura Superstition but I like the sound of 'Laddie Rocks'; is that a Bruichladdich? Yes, sorry, it is indeed Bruichladdich ROCKS. BTW, all my current "all-rounds" are at 46% Nice range of choices you have access to !